This is part 1 of 10 of the Survival shooter tutorial, in which you will setup a pre-designed environment with lighting and background music. having a dream that all of his toys have come to life. score points and eventually meet your demise. some of the new UI and lots of other stuff. you can't win, you can only eventually lose. So that's the way we prefer to make them. I have the project open. So first of all we're going to go to File - New Scene. of the editor that's totally cool, you can keep that. So layout drop down in the upper right and choose 2 by 3. That would get you a style that gets you something like this. So hopefully everyone's got a view like that? all the way over to the left. And we're going to call this Level 01. So save it as Level 01 in the Scenes folder. your scene up at the top of the interface. 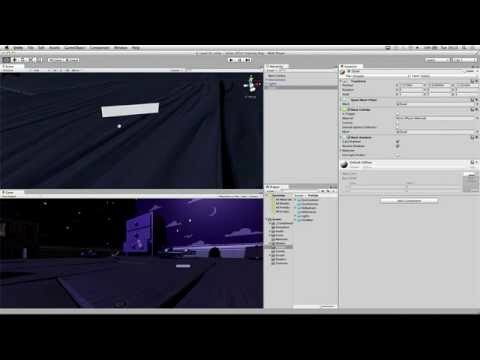 setup the environment, so I'm just going to show you that first. spawn them in to the game later with the enemies. and a number of collider and other elements. find a prefab called environment. Prefabs are represented by this blue cube icon. is therefore in the hierarchy and visa versa. Just make sure that you've got a decent view of this level. and Alt to rotate around. particular part of that later. positioned the environment at the origin. upper right and choose Reset Position. the scene and it should light your scene. positioning particularly because it's directional lights. With directional lights you only need to worry about the rotation. looking down on the scene. invisible line from the camera to the floor. so make sure the position of your quad is at 0. 90 degrees in the X axis. We're going to name this Floor. We don't want to actually see this. so the outline of this shape. We don't want to use this kind of grey for any reason at all. that you can then only see the collider outline. not the mesh filter or the mesh collider. the outline of the level, something like that. but this quad we're going to use layers. that we have a floor layer ready for you. our environment by adding some background music. use scripting to assign clips to. and then rename this Background Music. So we're creating an empty and renaming it Background Music. to make them do different things. over on the right in the inspector. we are going to do it once. to the audio source we can use the circle select. find the file you need. will assign it to that. For everyone's sanity uncheck Play On Awake. so uncheck Play On Awake and check Loop. In the volume in the component there is a slider. And we can just drag that down to about 0.1.
save your scene once more. That's the end of phase one, setting up the environment. The next thing we're going to do is look at our player character.